On Monday 22nd April 2019 the sun will rise at 05:53 and will set at 20:26. It will be a mild day, with temperatures reaching around 20.2°C. Today is expected to be a dry day, with a very low chance of rain. It will be quite a breezy day, with a maximum expected wind speed of 20mph. On Tuesday 23rd April 2019 the sun will rise at 05:51 and will set at 20:27. It will be a mild day, with temperatures reaching around 18.2°C. Today is expected to be a dry day, with a very low chance of rain. There could be quite a strong breeze in the air today, with a maximum expected wind speed of 21mph. On Wednesday 24th April 2019 the sun will rise at 05:49 and will set at 20:29. It will be a mild day, with temperatures reaching around 13.3°C. Some moderate to heavy rain is expected, 7mm of rainfall is possible today. It could be quite a gusty day today, with a maximum expected wind speed of 25mph. On Thursday 25th April 2019 the sun will rise at 05:47 and will set at 20:31. It will be a mild day, with temperatures reaching around 11.1°C. Some moderate to heavy rain is expected, 6mm of rainfall is possible today. It will be quite a breezy day, with a maximum expected wind speed of 22mph. On Friday 26th April 2019 the sun will rise at 05:44 and will set at 20:33. It will be a mild day, with temperatures reaching around 12.5°C. A light shower is possible, 1mm of rainfall is possible today. It could be quite a gusty day today, with a maximum expected wind speed of 24mph. On Saturday 27th April 2019 the sun will rise at 05:42 and will set at 20:35. It will be a mild day, with temperatures reaching around 10.7°C. Some moderate to heavy rain is expected, 6mm of rainfall is possible today. It could be quite a gusty day today, with a maximum expected wind speed of 27mph. On Sunday 28th April 2019 the sun will rise at 05:40 and will set at 20:37. It will be a mild day, with temperatures reaching around 12.3°C. A light shower is possible, 1mm of rainfall is possible today. It will be quite a breezy day, with a maximum expected wind speed of 17mph. On Monday 29th April 2019 the sun will rise at 05:38 and will set at 20:39. It will be a mild day, with temperatures reaching around 9.6°C. Today is expected to be a dry day, with a very low chance of rain. It will be quite a breezy day, with a maximum expected wind speed of 19mph. Come and enjoy the Wensleydale Cheese Experience, from learning about the history and watching the cheese being made to savouring the finished product in our Cheese Shop, Restaurant & Coffee Shop. Our Visitor Centre, which also offers free cheese tasting in our much-loved cheese shop & deli, plus an extensive gift shop, is situated in the picturesque market town of Hawes in Wensleydale in the heart of the Yorkshire Dales. 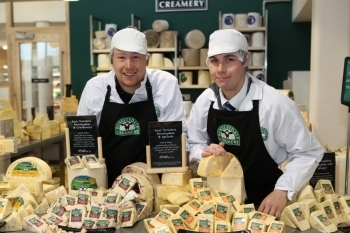 The Wensleydale Creamery in Hawes is famous the world over as the home of Yorkshire Wensleydale cheese, which achieved European Protected Geographical Indication (PGI) status in December 2013. This means that Yorkshire Wensleydale cheese is the only one actually made in Wensleydale itself - if it doesn’t say Yorkshire Wensleydale, then it’s not from Wensleydale! The Wensleydale Creamery continues the art of traditional cheese-making that dates back nearly a thousand years, using milk from local farms to handcraft their delicious range of cheeses.